National Novel Writing Month is almost upon us! To help you prepare, I want to talk about my favorite writing tool and the best ways to make it work for you this November: Scrivener, the best word processing program out there. Anyone who has tried to write a novel using Microsoft Word knows that it’s not designed for long projects. Moving a chunk of text from one part of the document to another is a frustrating exercise in copy-and-paste. Looking at two scenes side-by-side involves a lot of clicking between windows. Referencing research materials means sorting through documents in other programs. In general, Word is a clunky, cumbersome program that just isn’t suited for big projects like novels, or for writers who don’t work in a strictly linear fashion. Microsoft Word assumes that everyone writes in chronological order, from beginning to end; Scrivener makes no assumptions at all. It’s designed to work around you, not the other way around. 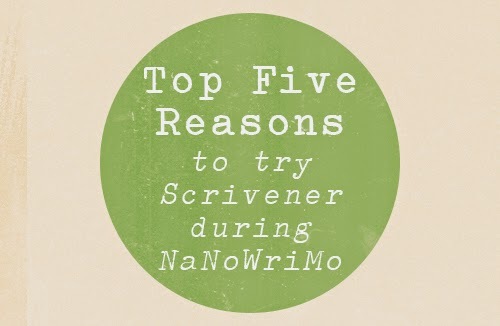 Scrivener has tons of features, and I certainly use many more than the five I detail here, but these are the ones I think will be most useful during NaNoWriMo. Note: I’m not associated with Scrivener in any way, and I’m not getting any kickbacks or anything of the kind. I’m just in love with this program. I even wrote this blog post in Scrivener! It transformed the way I write, and I think everybody should at least give it a try and see what it can do for them. The idea behind Scrivener is that writing a long document like a novel is easier when it can be broken into manageable chunks. These chunks can be as big or as small as you want, and can be divided any way you choose. You might, for instance, desire chapter-sized chunks. I prefer scene-sized chunks. For NaNoWriMo, you might make a new section for each day and label them accordingly. Every document of your Scrivener project has an associated note card. You can view all the note cards together on a corkboard, and rearrange them easily by dragging and dropping. This feature alone revolutionized my writing process. You can assign color-coded labels to your cards, in the form of either a push pin or a corner mark. In my current WIP, I use the pin colors to indicate the POV character of each scene. This makes it easy for me to make sure nobody has too many POV scenes all in a run, and that nobody goes too long without a POV scene. Different writers use the pin colors for many different purposes. If you want, you can add a status stamp across each note card to show you at a glance, how complete each piece is. Scrivener provides a few default stamps, but you can change these and add your own. My stamps are: To-Do, Incomplete, First Draft, Revised Draft and Final Draft. Come to think of it, you don’t necessarily have to use the stamps to indicate the status of the section you’re working on. Experiment! A screen shot of my corkboard and binder for Lights (Flicker #3). To the right of the corkboard, you’ll see the binder, which is a list of all the documents and folders in your Scrivener file. You can drag and drop your documents in the binder as well, just like on the corkboard, and you can show or hide the binder at any time. You can also see some of my other folders: plot-related stuff, related writing I’ve imported from Microsoft Word, my “idea jar” where I keep small notes as they occur to me, and my folder for writing that’s been cut from the manuscript. And those are just a few folders. These are part of my Scrivener project file, but they’re not part of the actual manuscript. Basically, Scrivener makes it very easy to see your project as a whole and as individual pieces, depending on your needs. This is one of my favorite Scrivener features. It tracks your word count—but more than that, it also lets you set word count goals, both for your entire draft and for your individual writing sessions. I don’t really use the draft target option, but I almost always set a session target when I sit down to write. I usually challenge myself to write 1,000 or 1,500 words per session, but you can set your target as low or as high as you want. I set a session target pretty much every time I sit down to write. For NaNoWriMo, being able to track your daily progress like this is invaluable. No more math! Just plug 1,667 into the box and start writing! My favorite part is how the progress bar fills up as you write, turning from red to orange to green as you near your target. Seeing my progress really motivates me to write more and to write faster. When I write in Full Screen Mode, I make that bad boy as opaque as possible. Once you’re in Full Screen mode, you can customize its appearance to suit your preferences—say, make the “paper” wider or narrower, and make the background more or less transparent. You can even import your own image to use as the background. Play around and find a configuration that looks beautiful to you! When you’re finished with your manuscript, Scrivener makes it a breeze to compile your documents into a single file and export the whole thing into a bunch of different formats—Kindle, ePub, Word document, PDF, and pretty much any other format your heart can possibly desire. Then you can print your novel, email a PDF to your beta readers, load it onto your ereader and so on. That last one is great for me: Reading my drafts, in full, on my Kindle helps me think less like a writer and more like a reader, which is vital to my editing process. This might be the best part: You can use Scrivener for free for thirty (non-consecutive) days. Sounds perfect for NaNoWriMo, right? And if, at the end of the trial, you decide you don’t want to keep using Scrivener, it’s really easy to export your work into other formats (say, one that’s compatible with Microsoft Word), so you don’t lose any of the writing you did with Scrivener. After you’ve gotten a taste of Scrivener, though, I seriously doubt you’ll want to go back to the Dark Ages. All the better, Scrivener is pretty inexpensive: The Windows version is just $40 (and $35 for students). Compared to other writing programs, that’s dirt cheap. Really, it’s a relatively small investment with a really big return, because Scrivener will improve your writing life. Learn more about Scrivener and get started on your free trial on the website, Literatureand Latte.